Our first big vacation on Samadhi! We are taking off from Blaine, WA to head to Desolation Sound. 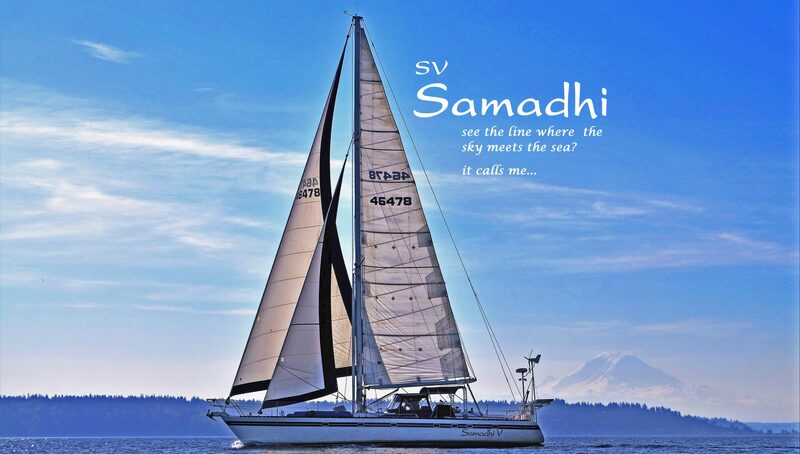 First we’ll talk about how Samadhi got to Semiahmoo resort’s marina. In the past (previous to kids and having a boat dog) when we’ve gone to Desolation Sound we’ve “staged” our boat as far north as we can. So of course it made sense to do this once again. We take into account checking in to Canadian customs and how far out of the way we need to go to do that. We have Nexus but we still need to “swing” by a customs dock to see if they want to check over the boat. Anyway, in our research we discovered that Blaine would be a great place. It’s as far North as you can get in Washington (except Pt Roberts which is further west) and there is a small little customs post as you’re leaving the bay to the north. So when Dan got off work Thursday August 27th he drove himself up to Semiahmoo to meet Ashley, the kids and the dog. It’s about 115miles from Dan’s work and our house and of course he got off work in the middle of rush hour traffic. We left one car there and then they all headed together the 145miles to Tyee Marina in Tacoma. We got all our stuff unloaded and finally climbed into bed around 130am. When you’re in a sailboat that does approx 8mph you clearly don’t get anywhere very quickly so if you’re going to do a LONG passage you get up early. So at 5am we were up and moving, we need to get this boat 120+ miles to the north which is more than a 15 hour passage. The day was uneventful, long for sure. They say you shouldn’t come into a unfamiliar port in the dark. That’s probably good advice. The bay was shallow, markers hard to see and the marina difficult to navigate. On top of that our slip got moved and we haven’t seen it yet. It’s only 50’ so a little short for Samadhi, way too thin (we have just a hair over a fender’s width between us the very nice power boat in the port side of the slip) and is a starboard tie, she doesn’t dock to starboard well at all. It didn’t go well. But we finally made landfall and Ranger got to get off the boat for a potty break after a nonstop 16 hour sail. Saturday morning we got up and headed the 116 miles home. Sunday was back to usual with Dan off to work except we had a very large windstorm move thru and the marina called to say Samadhi needed extra mooring lines to secure her to the dock. So, Ashley and the kids went back up the 116 miles to get her better secured, we were there about 30 minutes then headed the 116miles back home. What a weekend! During the week Ashley worked to get all the remaining things in order at home so we could head back to the boat Thursday night. Ashley’s dad, John, is coming Thursday afternoon to pick Ashley, the kids and dog up and then meet up with Dan in Everett and we’ll all head to Semiahmoo from there. It was a tight fit in his truck with 2 kids in car seats, 3 adults, 2 dogs and a family’s stuff and food for 2 weeks. Friday morning about 6 we said goodbye to John and pushed off the dock. The wind and seas were calm. It was a quick trip over to the customs dock and we got all checked in via phone. The previous week was finally behind us and we were ready for a great vacation, showing our kids one of our favorite spots in the entire world. As we turned north at Point Roberts we were hit head on with gusty wind and big seas. Pounding in to the seas is pretty miserable when you’re an adult and you know the boat is fine and it’s just something you have to endure. When you’re 4 & 2 it’s very scary. So after doing that for over an hour and knowing we’d be doing it for the rest of the day we decided to turn West and head to the Gulf Islands. Doing so meant we were abandoning the trip to Desolation Sound, if we couldn’t get there most of the way today we wouldn’t have enough time to get there enjoy and get back in the 2 weeks we had. It was disappointing to say the least but we want our kids to LOVE being on the boat and enjoy all their time on it. We made our way to Montague Harbour and caught a buoy in late afternoon, which we considered lucky since it is Friday of Labor Day weekend. We spent the next 2 days there. Saturday was Alexander’s 3rd birthday so we made him a cake, went exploring and played in the water. The next day we slipped the mooring and went over to Bedwell Harbour, we stopped at their fuel dock before anchoring. They have a pool and it’s been pretty sunny so we stayed a few days. From there we tried this tiny little anchorage where we were the only boat. Often you need to stern tie here but since we’re by ourselves we anchored right in the middle. Around dinner time a little tug boat came in and anchored right next to us. Samadhi didn’t have enough room to spin on her anchor so we pulled out our stern tie line as well. Doing so made our rudder awfully close to the shore line rocks but all seemed well when went to bed. That morning Ashley woke to a weird sound coming from the back of the boat so both her and Dan jumped up to see what it was. During the night the tide went out A LOT and our stern line was no longer snug. We’d swung over kind of close to the tug (not close enough to hit them) and much closer to the rocks. As we were pulling in the anchor line and tightening up the stern line we decided to just pull up anchor and go. Dan got the boat started and we were off. Oh, no… the dog hasn’t gone potty yet. Ashley and Ranger jumped in the dingy and zoomed to shore while Dan got underway. We’ve gotten good at what we call “underway water transfers”. Once we got out of the protection of the islands the wind picked up again much like our first day. Our goal was to head to Sidney spit, we arrived there fine and got anchored but the 25mph winds were uncomfortable and the anchorage is really shallow, 10 feet is pretty deep there so if our anchor drug we would quickly be in the mud. So once again we decided to abandon the plan and move on. But where to? We’d seen all that we enjoy in the Gulf Islands so decided to head back into US waters, which meant checking back in to customs. There aren’t a lot of places in the San Juans to check in and the closest place is Roche Harbor so that’s where we headed. We stayed anchored there for a few days and contemplated what to do with the rest of our vacation that wasn’t going as planned. Ashley’s dad was staying at a timeshare condo just a few ferry rides away so we invited him to come visit and we also thought her mom, Deb, would like to come after John left. John and Blue Boy arrived at Shaw island via ferry, Ashley picked them up in the dinghy. We did an “underway water transfer” onto Samadhi. Turns out when it comes to dogs it’s much easier to this kind of transfer when the dog can jump all the way from the dinghy onto the boat. Blue Boy wasn’t interested in this at all. John did better, thankfully. From Shaw Island we motored over to Sucia where we stayed a few days. The day Deb arrived we went back to Shaw, did the transfer and Ashley took him and Blue Boy to the ferry landing where Deb had just arrived. Then we reversed the process meeting back up with Dan. Deb didn’t bring a dog so that made it easier. We headed East a bit to Spencer Spit and dropped anchor. We played on the beach that day and the next and enjoyed having company. The weather was sunny but breezier than we expected so it wasn’t quite so warm. The radio forecast was getting worse so we made the decision once again to pick up anchor and head somewhere more protected. Ashley zoomed Deb to the Orcas Island ferry landing and zoomed back to Spencer Spit where Dan was ready to pull up the anchor, within minutes of her return we were underway. The plan was to make it thru Deception Pass and anchor on the inside to avoid the 30+ mph winds forecasted from the West. The trip thru the pass was uneventful thankfully the tides were timed perfectly. When we got to the 1st anchorage it was full so we continued east, the next anchorage… full. We found a spot to anchor that was kind of out of the way and that would offer decent wind protection but once the anchor was down we were unhappy with the current ripping thru it. The guy next to us couldn’t get a good set on his anchor so we pulled ours up and continued on. Where to? Maybe Oak Harbor. By now the winds were building again and when we turned west (where the winds were forecasted to come out of) we got hit with steady 30mph wind. It was getting dark as we came upon Oak Harbor. The marina looks to be very shallow and we haven’t been there before and now that it’s dark maybe it’s not so smart to head in. We passed Oak Harbor to the North and headed into Penn Cove. To get some protection from the wind was headed as far west as we could into the cove and anchored. With 30mph winds neither Ashley nor Dan will get any sleep but after we tucked in to bed they slowly diminished and became very light around midnight. There isn’t much to do between here and our home marina so the next morning we got up and continued on making our way back home. Its days earlier than we’d hoped to be back and our trip hadn’t gone at all as planned but such is life. Ashley’s parents got to join us which was nice and we’re thankful to have a boat that is strong and capable and keeps us safe. Anytime the weather or seas are trying we learn more about how great Samadhi really is and gain more confidence in her. Not many pictures got taken on this trip unfortunately but here are a few. See that funny shape at the top of Samadhi’s mast? That’s Ashley. It turns out that eagles like to sit atop sailboat masts to look for something good to eat. They also prefer the highest possible mast to get the best view apparently. Samadhi has had the tallest mast in both marinas we’ve had her. What that means for us is that we either get to clean up the remnants of their dinner off our decks (think baby pigeons and fish) or SOMEONE gets to go up the mast to repair the damage they’ve done to the instruments up there. That someone is Ashley.